Two adorable, private cottages right on the Atlantic Ocean. Located in the heart of Islamorada at mile marker 83. This stunning property is truly a tropical paradise with a private, sandy beach and observing pier. Relax at the beach or cool down in the beachside pool. The front home sits waterfront with two bedrooms and two bathrooms. The garden cottage sits back on the property with two bedrooms and one bathroom. Entertain in the pool room with pool table, wet bar, poker table and more. $8,000/week & $24,000.00/month Call for Holiday Rates. There is a nonrefundable pet fee of $400.00 if we accept your pet for the rental. Pets are screened prior and it is solely up to the owner to accept them for the rental. The viewing dock is just that, it is too shallow for boats so boats are prohibited. But great for light flats fishing, catch small flats fish or pitch a kayak out. We do have information on nearby marinas for dockage. 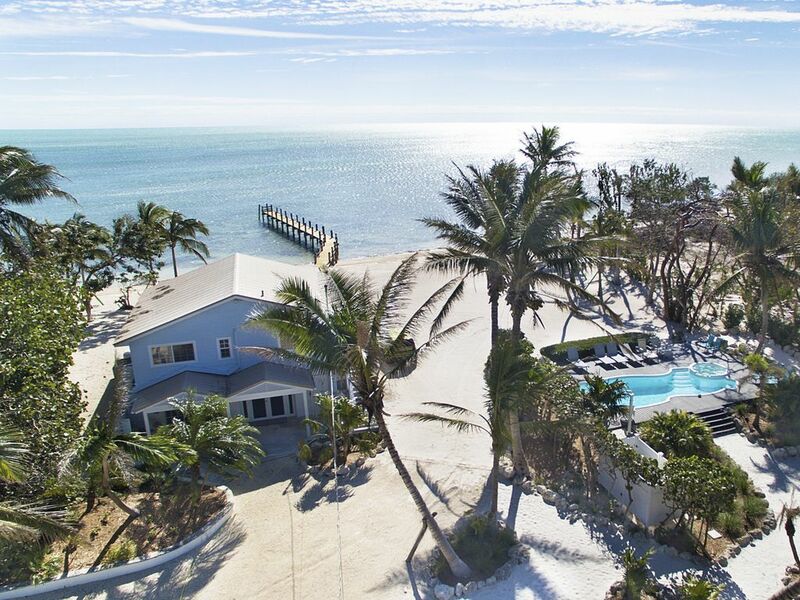 Sea Ranch is conveniently located on the Old road with the hustle and bustle of the village of Islamorada. However the ocean side sits between two empty lots allowing a fantastic sense of privacy. Poker table, pool table, and more. Pool w/ upper jets. This is a heated pool. Please note, The separate jacuzzi is not warmed to Hot tub temperatures, but will be at the same temperature as pool (85 degrees). Lovely property, needs some work. We just spent two weeks at Sea Ranch and I have many wonderful things to say about the property. The two cottages allowed for our guests to enjoy time together and some privacy. The pool table and game room in the water front villa was great fun. The landscaping was gorgeous and we really enjoyed waking each day to the amazing view. Very nice pool. Well appointed kitchens. Great location. Loved that our golden retriever could join us on the trip. Wonderful large porch looking out to the water. Great hammock and lots of shade. On the downside, a rental that sleeps 14 could use more than two bikes. The two that were there were both flat. There was no bike pump. On our arrival we could not access the bottom floor of one of the houses, as the lock had been changed. The second house is really on the street (has no view of the water), and they were doing roadwork for the entire two week stay. The dock is in frightful disrepair, close to unsafe. The beach really is not nice for swimming, a great deal of debris washed up each morning and there is a a lot of vegetation growing in the water. The water is very shallow (but our dog loved it!). Really old and useless dishwasher in the house closest to the beach. Small and outdated bathrooms. We got to know the fix it man, Jay very well. Shannon and Robin at Island Villa Rental Properties, Inc. were super responsive and we will be sure to visit Islamorada again. We are glad you enjoyed your overall stay! Sea Ranch is one of our favorite properties we have listed, and guests typically love their visit. We were sorry to hear about the flat tires on the bicycles, but we were glad we got Jay over ASAP with functioning bike pump. We are also dealing with the same roadwork all over the island, and it’s a pain for us all, but we are told the construction will soon be finished. The problems with the shore arise in Sea Ranch’s natural Upper Matecumbe shore, which is typically shallow with rocks, sea life and birds, and vegetation during the summer. Thank you, and we look forward to seeing you again, in beautiful Islamorada!